RAILROAD.NET • View topic - Fort Lee/Cliffside Park railroad? If you look at Freedom Park in Fort Lee on Gogle Earth, it resembles a ROW of some sort.The ROW is almost traceable up to the GWB lower level toll plaza on the north. Head south towards Cliffside Park and there is a Railroad Avenue along the ROW. The ROW is still pretty obvious up to the Palisade Avenue/Gorge Road junction (occupied by Cliffside Park Housing Authority building). I'm guessing this railroad ran along Palisades Avenue, if you go south to the park you'll notice something that resembles a wye junction. After here the main probably ran west then curved south on what is now Main Drive. There seems to have been another wye junction with Riverview Drive. If you head west from here, you run into 79th street. Some rail may have ran through here because it is a rather wide street, complete with some medians. Where the rail went west of here is unclear. I'm not sure about the other spurs I mentioned here but JFK Blvd East may be the ROW for another railroad. A trolley line ran through the South Fort Lee area as well. It probably branched off of Broad Avenue and went along present-day Route 5. The ROW is pretty clear if you look on Grantwood Blvd, which sits on the former trolley line. From here the Route 5 cuts through the ROW, and a clearing is visible running west along Route 5. Notice how the Route 63 bridge has a big opening underneath it. From here the ROW is taken up by Columbia Avenue, and it's all pretty clear. The townhouses along Kensington Drive take up a portion of the ROW before it goes back to Columbia Avenue heading down the hill. The ROW is then taken up by Undercliff Avenue, and right along Panorama Drive is probably where the old station was. There may have also been a funicular railway of some sort from Undercliff Ave to Kensington Drive. I apologize for asking all of these questions lately, but where did the Edgewater/Fort Lee railroad run to? Re: Fort Lee/Cliffside Park railroad? Excellent book on such with maps and photos by Edward Hamm, Jr.
the famous Palisades Amusement Park was originally a trolley park. 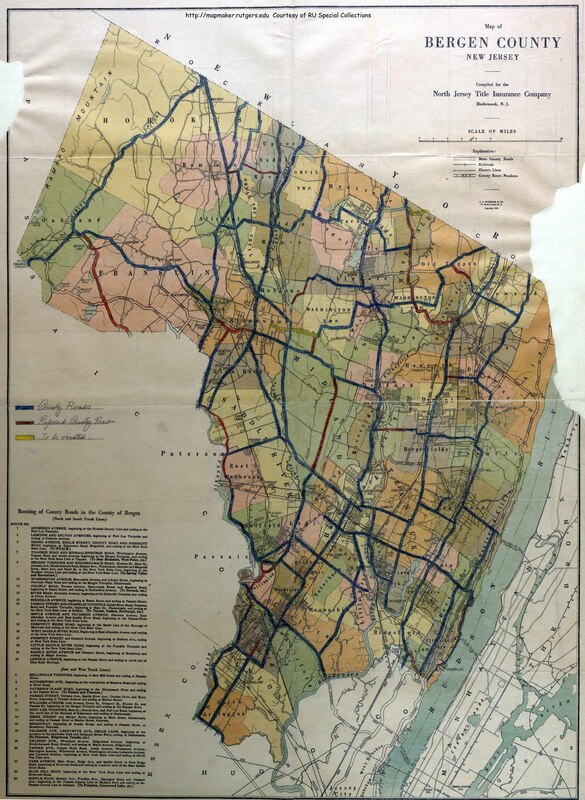 "North Hudson County Railway opened 1861. Three companies were consolidated in 1874 to form the North Hudson County Railway Company. North Hudson acquired the Pavonia Horse Railroad Company in 1891, opened the Hudson & Bergen Traction Company in 1893, and opened the Palisades Railroad in 1894" Eventually all part of Public Service Railway. That's the same company that became PSE&G, isn't it? I guess if they were generating power to run their traction lines, they probably had excess to sell to residential service, and now the trolleys are gone, their sideline became their main business. Shalom wrote: That's the same company that became PSE&G, isn't it? I guess if they were generating power to run their traction lines, they probably had excess to sell to residential service, and now the trolleys are gone, their sideline became their main business. They operated the bus network as well, into the early 80's when the state thru NJ Transit Bus Operations took over. It was known as "Public Service Coordinated Transport" up until the early 70's or so (with the "coordinated" no doubt a throwback to when they had multiple modes, including trolleys, to coordinate). During the last 10 years or so of existence it was known as "Transport of New Jersey", the name already evoking a future state takeover. Whether that was the intent of the renaming I do not know, but I do recall speculation to that effect in the press at the time (as that was also the era of increasing state/ govt involvement into rail transit as well). The company that was formed by Thomas Nesbitt McCarter in 1903 was the holding company, Public Service Corporation of New Jersey ("PSCNJ"). Its three primary subsidiaries, in order of importance at that point in time were Public Service Railway Company, Public Service Gas Company ("PSGC") and Public Service Electric Company ("PSEC"). Each of these three absorbed hundreds of small railway, gas and electric companies. In 1928 Public Service Electric and Gas Company ("PSE&G") was formed and took over direct ownership of the assets of PSGC and PSEC. In 1948 after protracted litigation rather than become jurisdictional under the New Deal legislated federal Public Utility Holding Company Act of 1935, PSCNJ became a paper company to preserve the name, and PSE&G became the parent company with direct ownership of all electric and gas assets, plus the subsidiary transportation company which included buses and trolleys. Indeed, electric companies in the late 1800's were the offshoot of the trolley businesses. Businesses open late in the evening such as hotels and taverns asked the trolley company that was nearby to supply electricity for lighting. Eventually, that business grew and separate electric generation and distribution companies were formed to serve all types of customers including residential. In 1985 Public Service Enterprise Group, Inc. was formed to become a single state holding company, which therefore was permitted to be exempt from the federal Public Utility Holding Company Act, and PSE&G became its largest subsidiary. The other two large subsidiaries are PSEG Power, LLC an electric generating company, and PSEG Nuclear, LLC which owns and operates nuclear electric generating units. Both of these companies' assets were transferred from PSE&G to create a "firewall" between PSE&G's electric delivery business which remains fully regulated, and electric generation which operates in a wholesale intensely competitive market under lighthanded regulation.